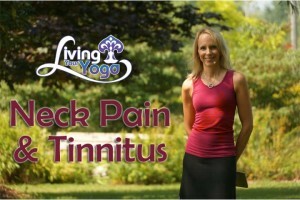 As far as your Tinnitus, that you are going to have to speak with your medical doctor about and find the root cause. Tinnitus meaning “ringing” is the perception of sound within the human ear (ringing of the ears) when no actual sound is present. Tinnitus is not a disease, but a condition that can result from a wide range of underlying causes: neurological damage (multiple sclerosis), ear infections, oxidative stress, foreign objects in the ear, nasal allergies that prevent (or induce) fluid drain, wax build-up, and exposure to loud sounds. So, if the root cause was nasal allergies, then yes, yoga could help and we could discuss ways that yoga could help. But I would really need to know more about the root cause and then look at how yoga could treat that cause for the ringing.